This article is reprinted from Issues & Observations, CCL Press, Volume 17, Number 1, 1997. 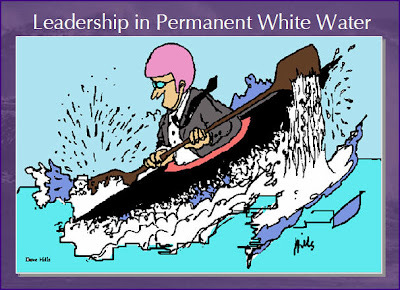 In his book Managing as a Performing Art, Peter Vaill introduces an intriguing metaphor for the change, uncertainty, and turbulence that now characterize organizational life: permanent whitewater. “Most managers are taught to think of themselves as paddling their canoes on calm, still lakes. . . . They’re led to believe that they should be pretty much able to go where they want, when they want, using means that are under their control. Sure there will be temporary disruptions during changes of various sorts–periods when they’ll have to shoot the rapids in their canoes–but the disruptions will be temporary, and when things settle back down, they’ll be back in the calm, still lake mode. But it has been my experience . . . that you never get out of the rapids. . . . The feeling is one of continuous upset and chaos” (p. 2). This, or any, metaphor can best help us stretch our thinking when we draw out both of its realms (in this case, white water and organizational life) and explore the connections in detail. Vaill says very little about the actual experience of white water. If we take a good look at that realm, however, I believe we’ll find that the ways that people develop efficacy in the turbulence of white water are suggestive of ways people can develop efficacy in the turbulence of organizations. How can I claim this? My avocation is kayaking whitewater rivers. I have run many eastern U.S. rivers including the New River Gorge, the upper Gauley, and Chatooga’s Section IV. As a Research Scientist at the Center I have also spent a lot of time studying individuals and organizations in the midst of turbulence. Let’s start with the current in a whitewater river. A novice river-runner typically sees what appears to be a random froth of rocks and water. One of the first lessons is “reading the river.” How can something random be read? Properly speaking, white water is not random; it’s chaotic. Chaos has random elements, but it also contains exquisite patterns. In rivers, these patterns tend to be quite stable, so that a snapshot of any single area tends to look the same from moment to moment–although it is constantly reoccupied by different water molecules. Reading a river is thus a matter of learning to recognize the patterns and associating the patterns with their effects on boats. The most important pattern element in white water is water moving upstream. Yes, upstream. Features of the underlying river bed that provide resistance to fast-moving water create varieties of eddies and waves containing local upstream currents. Think of the overall pattern as one of great masses of water moving more-or-less straight downstream, embellished at the edges by circular swirls (eddies and waves, or what is sometimes called “turbulence”). These swirls make all the difference. A skillful boater can place his or her boat on even a small eddy, with little effort. This allows the boater to slow down, turn, stop, or even drift upstream a bit. How does one learn to read a river? Two basic approaches are available. The first is by instruction in the types of river patterns and the rules for navigating these patterns. The second is through play. The former needs little explanation here, being the essence of formal training in any realm. The latter is quite intriguing for our present purposes. Skillful play is the hallmark of an expert boater. Play is also a way that beginners can learn to read and negotiate white water. It is the act of stopping at a point in the current and exploring a single pattern or a series of patterns; exploring the complex interaction of the river, boat, and boater. For example, a boater may play by surfing a wave, moving back and forth across the face of a stationary river wave rather than moving downstream with the current. Play involves discovering rules, testing rules, breaking rules, and inventing new rules. Play requires relative safety, so that the consequences of rule violation are minimal–for instance, playing above a large still pool rather than above a dangerous waterfall. What I am referring to here is similar to what Ken Gergen calls serious play: a spirited way of deeply but safely exploring patterns that have significant longer-term implications. For example, part of the reason for playing on this wave now is that tomorrow I may need to surf a wave for the purpose of avoiding a dangerous waterfall. All white-water play is at least a little bit serious. People who run white water but don’t play rarely advance much beyond a beginner’s level. Boaters who don’t play tend to have an overly rule-bound approach to the river that does not allow innovation at crucial moments; the style of such boaters is usually sloppy or rigid, in either case ultimately dangerous. The chaos of white water inevitably requires innovation at crucial moments. Now that we’ve taken a closer look at whitewater, let’s see what it can tell us about organizational life. Obviously, the metaphor strongly suggests that play in that realm is important. Consider a situation that almost all of us have faced: learning to use a personal computer. The MS-DOS operating system requires you to adhere closely to arcane rules of operation. Learning DOS is difficult because play is difficult (unless you’re a hacker) and mistakes often cost-ly. The Apple system (and now Windows) is radically different; most people can learn the complex ways of computing by playful experimentation with a sense that single mistakes are not usually costly. People who don’t play with their computers, and only learn by the book or in classes, tend to learn and innovate more slowly than people who do play. Here’s another example: I have done work with an organization that has instituted “feedback groups,” in which peers meet several times a year to give one another detailed feedback in a small-group setting. The groups that have done the best have approached this potentially stressful task with a measure of serious play. That is, they have created a safe, trusting atmosphere in which they can take measured risks and even make mistakes and see what happens. The more successful groups show a sense of trying to figure out the dynamics within the complexities of coaching, often bending the formal rules in the process. Chaos in organizations is not random. Organizational turbulence is full of patterns. There are almost unimaginable layers of order enfolded within chaos. The nature of the order can be quite surprising, and is sometimes invisible to conventional wisdom. Turbulence can be an enormous aid, rather than an impediment, to prediction and control. Find new ways to learn the patterns–to “read the river.” The development of this kind of perception is a core competency, not a frill. Play is essential within organizations if people are to develop an eye for patterns within chaos. Play is essential for action and innovation within chaos. Being consistently rule-bound is crippling. Serious play is a vital supplement to traditional learning. Organizational play requires safe places in which to break rules, make mistakes, and recover–and then try it again, and again. Find the higher-order rules which govern breaking rules with relative safety. Fundamental innovation can come from serious play at the fringes of organizations. Groups of mavericks busy violating common sense aren’t all that bad. Making sense of chaos is ultimately a community venture including both the center and the fringe. Make room in the community for both the center and the fringes (and make sure any “skunkworks” are not in exile from the community). Peter Drucker said, “The greatest danger in times of turbulence is not the turbulence; it is to act with yesterday’s logic.” So, it is interesting to note that the newest high-performing kayaks barely float. Maverick whitewater enthusiasts, playing with the shape of kayaks as they built them, ultimately came up with one shaped like a potato chip. It has a very thin profile and is slightly concave on top, with bubbles built in for the kayaker’s legs. Because of the low volume of air it contains, this kind of kayak almost doesn’t float in calm water. Suicide? That is what common sense suggests–but common sense is wrong. In whitewater, all or part of the boat can be made to dive beneath the swirls and into the masses of water beneath, which contain their own distinct patterns. These patterns are inaccessible to kayaks that float on the surface (now referred to with the semiderogatory label of surface boats). These patterns afford means of river-running, and play, that were previously undreamed of. The new design can perform something like a wing in the laminar flow of the deeper currents: They “fly” underwater. Gergen, K. J. (1991). The saturated self: Dilemmas of identity in contemporary life. New York: Basic Books. Palus, C.J., & Horth, D.M. (2005). Leading creatively: The art of making sense. Ivey Business Journal. September / October. Reprint # 9B05TE05. Palus, C.J., & Horth, D.M. (2002). The leader’s edge: Six creative competencies for navigating complex challenges. San Francisco: Jossey-Bass. Vaill, P. (1989). Managing as a performing art. San Francisco: Jossey-Bass. This entry was posted in Visual Explorer™ and tagged strategy, video, world. Bookmark the permalink. Pingback: 10. Don’t Lose the Core to Do the More: Maxims for Impact and Effectiveness | Transform. Perform. Grow.